A battle wages in an underground Brooklyn studio. It’s a war against mediocrity, an epic sound clash. The entire struggle is taking place inside the head of one man: Victor Axelrod a.k.a. Ticklah. The fruits of the brawl can be heard on Ticklah Vs. Axelrod, released September 18, 2007 on Easy Star Records, the same outfit that brought us Dub Side of the Moon and Radiodread. The album is roots reggae steeped in Ethiopian melodies, salsa, and ska, dripping with trippy dub production. Even if you haven’t heard his name, you’ve probably heard Axelrod’s contributions to dozens of familiar projects. As a co-producer (and the keyboardist) of Dub Side of the Moon, he helped craft one of the best selling reggae albums of the decade. As a key member of the Afrobeat collective Antibalas, and as an original member of Sharon Jones and the Dap-Kings, Axelrod is known for nailing grooves and then dancing around them in jaw-dropping capacity. His session work with Mark Ronson has put him on tracks by Lily Allen, Robbie Williams, and Amy Winehouse (including the hit "Rehab"). And he’s partnered on hit remixes with DJ Spinna, including Shaun Escofferey’s "Days Like This" and Les Nubians’ "Makeda." When he’s not collaborating with other musicians, Axelrod tackles his own musical demons; the results are some of the most original music released this year. Some might call this a dub record, due to its heavy use of reverb, delay and effects; but that’s not quite it. Call it Holistic Dub, since Ticklah approaches the music from every one of its individual components-rhythm, melody, harmonies, arrangement, sound-to craft the whole song. "While much has been said about King Tubby and Lee Perry, what is always overlooked is the source material they were working with to make dub music," says Ticklah. "The musicianship of the rhythm sections, the engineering skills that captured the sounds in the first place, and the production values go unmentioned. The music on my record reflects my love, awe, and admiration for all these components of reggae music." A touchstone dub like "King Tubby Meets Rockers Uptown" was played by a tight reggae band; led by a groundbreaking instrumentalist, writer and arranger (Augustus Pablo); has one of the genre’s most distinctive voices (Jacob Miller); has a final mix by a sonic visionary (King Tubby); and was recorded at one of the greatest sounding studios in Jamaican history (Dynamic Studios). Ticklah tackles every one of these roles somewhere on this record and in his studio (and sometimes all at once). This obsession with so many elements of music creation-not to mention playing several instruments on the majority of the album-means that it takes time for Ticklah to finish a song. (The title of "Nine Years" is a humorous exaggeration about the length of time it took to create the track.) "I’m trying to put one simple thing with another to build something great. Like an architect or a furniture maker. The individual pieces may not necessarily be something to behold but the way they fit together, there’s hopefully logic to it all." "I often make myself very unhappy because I’m convinced that there are ways to make the music I’m working on better than it already is; hence the title of the album." 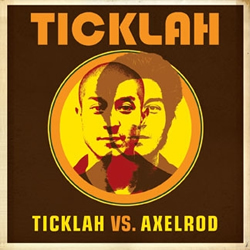 While Ticklah Vs. Axelrod springs from this musical inner conflict, it’s really a bit more tongue and cheek than dire, especially since it also recalls classic dub album titles. As crazy as Ticklah can drive himself, he’s still doing something he loves. As expected from a musician with as many credits as Axelrod, he brings in a few friends to help realize his vision. He calls his collaborators on this record "esoteric talents," because they are all players who exist outside of the cookie cutter. "Which is not to say there isn’t plenty of talent within the cookie cutter, either. It’s just that each of these guys has their own sound. Like Vic Rice’s bass, which works across all of the styles he plays from reggae to his Brazilian excursions, but doesn’t really sound like anyone else. Every one brings something like that to it." Victor Rice is a regular collaborator at Ticklah’s basement studio. Like Ticklah, Rice has played with a multitude of different outfits, including the Easy Star All-Stars, the Stubborn All-Stars and the Victor Rice Octet. The two met in 1997 through the Stubborn Records/Version City crew and hit it off musically right away. Guest vocalists include reggae stars Mikey General and Rob Symeonn, Vinia Mojica (best known for her work with De La Soul and A Tribe Called Quest), and Tamar-kali (of the Easy Star All-Stars and the documentary "Afro-Punk"). Symeonn and Ticklah go way back from when they worked together on "Anything For Jah," which was the first single Easy Star Records ever released, and more recently on the underground hit "Chosen One," the title track of Symeonn’s latest album. The two collaborated further on Ticklah’s 2001 release, Hi-Fidelity Dub Sessions: Roots Combination, which was Ticklah’s first full-length foray into reggae.